Window Revival’s window painting, window restoration, and sliding door repairs services. 1.) 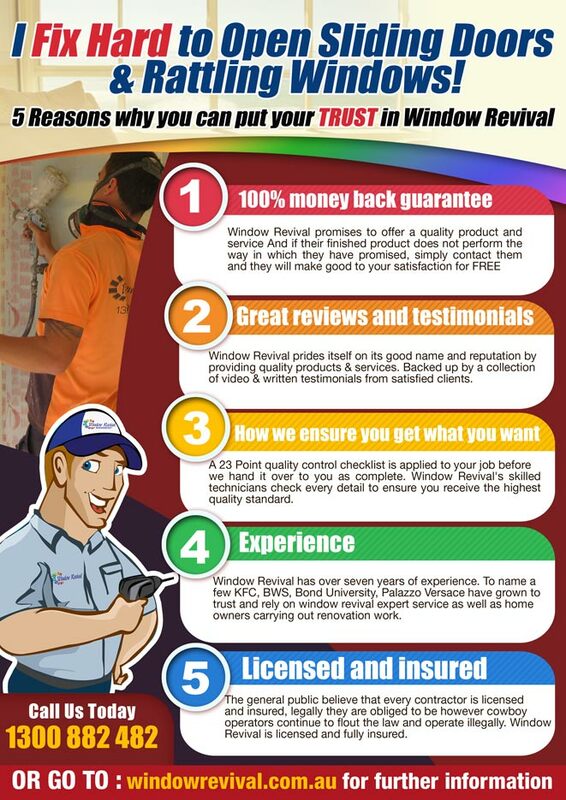 100% money back guarantee – Window Revival promises to offer quality product and services that if their finished product did not perform exactly the way in which they have described it, you can contact them within 30 days and they will make amends to your satisfaction for FREE. 2.) Experience – Window Revival has over seven years of experience. Technicians are able to identify problems and give you the right product or service for the job. They know which tools are fit for a certain job to give you complete peace of mind. 3.) 23 point quality control checklist – Before saying a job is complete, Window Revival’s skilled technicians follow a strict quality control checklist. If one item is not checked for quality completeness then they will continue on until all items within the list are accounted for. 4.) Licensed and insured – Many people take advantage of the fact that every contractor on the market is already licensed and insured. This is not an absolute truth. The good thing about this is Window Revival already has its own set of licenses and insurances. You can always contact them for proof and further details. 5.) Good reviews and testimonials – A company who has been around the market has already built a name for themselves. Window Revival has its own collection of great reviews and testimonials from satisfied clients. ← What to do When Your Locks on Your Sliding Glass Door Doesn’t Work?